This summer has been brutal, and from what we here there is more heat on the way! We want you to keep an eye out for signs of heat exhaustion in your dog and know some of the things to look for. Take notice when you’re outside or even inside, on those hot days. These signs can be serious and can be a sign of not only heat exhaustion but heat stroke. Simply wet it with cool water, wring it out, and strap it on. As the water evaporates, your dog's temperature lowers. When it's dry, you just wet it again and keep going. Keep your pet protected and know the signs. As always, consult your vet immediately for further advice pertaining to your pet and what to do if you think your pet is having a heat stroke or has signs of heat exhaustion. Stop in the market and see our selection of cooling jackets and vests to help prevent heat exhaustion. Yogurt or not to yogurt, that’s the question. Some will say dairy and dogs don’t mix, wrong. Yogurt is good dairy, just make sure it’s the correct kind. In some conventional yogurts, they may add some undesirable ingredients, such as colors, preservatives and sugars. The dairy used can come from cows that are given hormones to increase milk production where those hormones are passed on to your pooch. Additionally, they use homogenized and pasteurized milk when making their yogurt. Therefore, it’s important to know where your yogurt comes from before you add it to your pet's diet. Come in and taste the difference with The Dining Dog Yogurt, where everything is always fresh. No added sugar, colors, additives or artificial flavors the way nature intended! Just like you, your pooch sure loves the fresh taste of delicious fruit. Just like you, they can reap the many nutritional benefits of fresh fruits. Below we have come up with our favorites, and as always, stop by the market and see all the treats and dinners we prepare with many of these fruits. Fresh Watermelon - Watermelon is full of Lycopene. This is a great antioxidant and can assist in repairing the body from damage caused by a disease. Not only is watermelon a great antioxidant but it is loaded with healthy vitamins A, B-6 and C. Let’s not forget how refreshing and delicious they are during these summer months. Afterall, watermelon is listed as one of the world’s healthiest foods. Blueberries - This fruit is known for its anti-cancer properties and the fighter of heart disease in dogs. Also loaded with tannins which are known to assist in fighting those pesky urinary infections. Filled with antioxidants you can’t go wrong with the blueberry. Check back in July for National Blueberry Month where we will break down all the goodness this berry brings. Pumpkin - You sure knew we were going to talk about Pumpkin. I think this awesome fruit could be a blog on its own. FIBER, FIBER and did we mention Fiber? This magical fruit can help digestion in many ways, from constipation to diarrhea. It’s got you covered in both areas. It’s filled with antioxidants that can help with your pooches overall cardiovascular health. Apples - Not only are these super delicious but come in numerous varieties and your dog will love them. They are also filled with antioxidants and Vitamin C that you dogs diet will benefit from. Cantaloup - This is the eye fruit. The fruit salad staple you love can benefit your dog's eyesight as well. The Beta-Carotene that is found in cantaloupe is a great way to combat cancer and cell damage along with overall eye health. Cantaloup is also a good source of vitamins B-6, C and potassium. 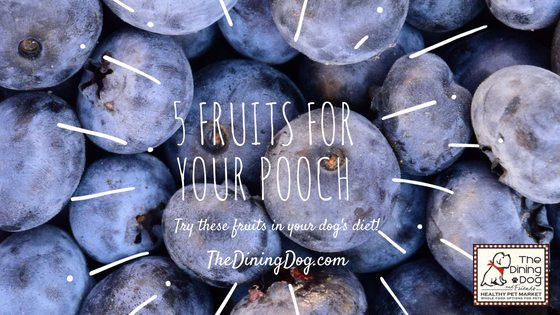 So why don’t you try some of these amazing fruits to your dogs dish tonight. The health benefits by varying the fruits and veggies in your dog’s diet are tremendous. Please stop by the market and discuss safe options with any of our associates. Safety first puppy lovers! February is the month of love. We are celebrating the Heart this month and it’s a great time to evaluate your pets heart health. Heart disease is very common among our pets, the good news is there are a few simple lifestyle changes you can make for your fur baby to lower the risk of heart-related conditions. Healthy Diet - Maintaining a healthy diet of whole food varied diet, including good fats. Exercise - Your dog loves cardo. Going on walks, swimming, hiking, running, playing ball outside. Maintaining a healthy heart should include regular stimulation and exercise. Both you and your dog will benefit. Dental Care - Plaque, tartar and infection in a dogs mouth can enter the bloodstream and can be a cause of congestive heart failure. You can keep your dogs mouth healthy by using fish oil. Fish oil helps maintain gum health which helps keep teeth securely rooted, which will help with preventing tooth decay. Don’t forget about your dental chews. We carry a great line of different dental chews. Taurine - Taurine can be found in real muscle meat foods - taurine is absent in cereal grains. It is super important for cats and dogs who are meat-eating predators that they are getting their diet from real meat. Lack of taurine in a diet can lead to serious eye and heart diseases. The vast majority of pet foods out there contain little or no real meat. Instead, they use byproducts. You won’t find any foods with by-products here at the Dining Dog and Friends. Popcorn - Popcorn is low in calories when made properly, air popping is at the top of the list. When popping at home we like to recommend using coconut oil. Popcorn has the ability to regulate blood sugar, lower cholesterol and improve the digestion process. By doing this you are helping to support a healthy heart. Stop in we have tri-colored organic popping corn for the entire family. Bee Pollen - Bee Pollen has many nutrients that include protein, amino acids, enzymes, coenzymes, vitamins, minerals and fatty acids make it great for animals and humans. The plant sterols and essential fatty acids reduce cholesterol, blood pressure and the risk of heart disease. Bee pollen also contains rutin, rutin has a protective action on the heart and capillaries. Hemp - Hemp hearts provide long-lasting energy and it does it without stimulants. Provides more energy with fewer fillers. They are a really good source of essential fatty acids and contain a good amount of fiber. The fatty acid composition has a significant impact on inflammatory processes which are the foundation of numerous chronic diseases, including cardiovascular disease. The high concentration of these acids support the transportation of oxygen throughout the body, oxygen will help block the bad stuff, like viruses and bacteria, to keep the heart healthy. Supplements - There are many supplements that can assist your pet with their heart health. CoQ10. This will help assure circulatory health and supports optimal function of the heart muscle. This is a fat-soluble supplement, meaning taken with a meal enhanced with fish oils is a power punch to guarantee absorption. Just because you put it in doesn’t guarantee absorption. Hawthorne - Sometimes called Hawthorne Berry significantly enhances circulation to the heart and the brain while improving irregular heartbeats and arrhythmia. This is used for congestive heart failure and is used to treat both low and high blood pressure. Look for our up and coming blog where we will be talking about absorption. For dog owners, dealing with a yeast infection can be one of the most difficult health problems to solve. Yeast occurs for many different reasons; however, food intolerance is usually the main culprit. Removing yeast from your pet’s diet can be a difficult challenge. The majority of pet food is loaded with these immune system attackers. Raw Diet: This diet can work wonders for a dog with yeast issues. You can also change to a partially raw diet by slightly cooking the food. You will need to add soft steamed vegetables and avoid carbs. Semi-Homemade Food: Choose a commercial homemade diet. Try a dehydrated formula for your dog. This diet is like the raw diet, but much easier and less time consuming. You just add hot filtered water. Think of it as “space-food” for your furry friend. It never hurts to add your own protein. Commercial Food: If you must use dry food, ensure that it is clearly labeled “Limited Ingredient Whole Food”. Ask for guidance from one of our trained associates here at The Dining Dog or schedule an appointment to review your baby’s diet. Home-Cooked Meals: The Dining Dog & Friends offers a variety of freshly made meals cooked here in our onsite kitchen. Made with the finest ingredients with your pets nutritional needs in mind. We can create special diets specifically for your pet. Coconut Oil: This is recommended even if your dog does not have yeast problems. The high amounts of lauric acid in the oil are what make it an amazing supplement for fighting off bacteria and other fungi. It’s great for dogs with allergies, digestive and heart or any immune issues or disorders. Pre and Probiotics: Digestive enzymes are critical to healing those infections. Probiotics are healthy bacteria and help digestion and are great for tummy issues. Aloe Vera: Give your dog a teaspoon per ten lbs.of aloe vera. Yes they can eat it! This is a real fungi bummer. Animal Essentials Detox Blend: This is a combination of herbs suspended in glycerine that will help your animal detox. Add Raw Yogurt (containing no sugar) - We offer our own home made raw yogurt. Apple cider vinegar like Braggs - make a 50% water 50% cider solution and use a topical since. This can be a big change in your routine for both you and your pet, the benefits will allow your pet to lead a happy, healthier and longer life. Try one thing at a time for 2 weeks and see how your baby responds before adding other things. November 12th marks the annual National Chicken Soup for the Soul Day! This day was created to celebrate who you are, where you have been, where you are going and who you will be thankful for when you get there. We are celebrating this day with a slight twist, Chicken Soup for Your Dog Day. Your pets do wonders for your mental health. They are there when you need a hug, a cuddle or even when you want to vent. The unconditional love that is good for the heart, mind, and soul. Let’s give back to man’s best friend with what else, but Chicken Soup! Did you know that chicken soup is wonderful for your dog? This is a great treat that can be poured over food or lapped up solo in their favorite bowl. Ensure that you are feeding them all natural organic chicken soup, check those labels! Stop in Saturday, November 12th and get a batch of freshly cooked, homemade chicken soups specially made with your pooch in mind. Fall is almost here and that means Halloween! One of our favorite holidays here at The Dining Dog & Friends. Not only is it the time of year we get to celebrate our store opening but we also like to celebrate Halloween with a costume parade for our furry friends. See our event HERE. We thought we would share a few tips and things to consider when purchasing or making your Pet Halloween Costume. Take into consideration the weather. It may be fall and a bit cooler in some parts of the country but it can get very hot quickly under those costumes. When trying on a costume for your pet make sure that your fur baby has plenty of room to move around and they can walk freely with nothing getting in the way. Pinching can be a problem with some costumes. Make sure there is nothing pinching or grabbing your pet's fur or skin. Be aware of any hanging or loose fabric, strings or objects. This can not only get in the way of your pet walking, sitting or laying down but also can be a choking hazard. Have fun! Make sure your pet enjoys wearing the costume. If you have to force your pet to wear it and they are absolutely miserable it may not be a good fit fo them. Fall Equals Pumpkin. Why Is Pumpkin Good For My Pet? Did you know pumpkin is good for both diarrhea and constipation? Pumpkin is loaded with fiber and beta-carotene. Dogs will convert this into Vitamin A in the body. Just like us, pets need to stay regular and pumpkin is a great source of fiber to help them do that. Help remove furballs. The same fiber can help your kitty with those pesky furballs. The fiber takes those furballs that are stuck in your pooches digestive system and gets them into that litter box. Feeding your cat a little pumpkin daily can help prevent those nasty furballs. Get rid of the worms and parasites. There is an amino acid in pumpkin seeds that is a natural dewormer. Grind up pumpkin seeds into a powder and give this in a treat. Sprinkling over your pet's food may affect the actual dosage, so be careful when doing this. Pumpkin can assist with obesity and weight loss in your pet. We know obesity is dangerous and affects millions of pets. Fiber-loaded pumpkin will make your pet feel fuller when feeding them a little less kibble. Shiny coat and hydrated skin. Pumpkin seeds are loaded with antioxidants and fatty acids that will help keep your pets coat and skin hydrated. You can toast the seeds (see below for preparation). Pumpkin supports the urinary tract. The oils that are in flesh and seeds of pumpkin support your pet's urinary tract. A great way to prevent or assist with stones or bladder infections. These are very painful conditions for pets and pumpkin is a great way to prevent and assist in healing. It’s just good. Pumpkin is a great nutritional addition to you pets dietary regiment. Not only fiber, but loaded with vitamin A, iron, potassium, magnesium, manganese, copper, and zinc. Due to it being loaded with antioxidants it may prevent some cancers along with keeping your pet healthy. Portions: Don’t overdo the pumpkin. A teaspoon or two a day is plenty. Seed Preparation: Spread seeds evenly onto a baking sheet, lightly coat with cooking oil, roast in a 375-degree oven for 5 or 10 minutes. Be sure to and cool before serving one or two as a daily treat. The Dining Dog & Friends provides many options to our customers in canned pumpkin and treats. Our bakery and kitchen have dinners, treats and baked goods for your furry family members that they will surely love. Stop in and pick up some items and allow your fur babies to enjoy the season with you. Is Garlic Good For My Dog? Have you heard about the benefits of garlic for you pet? We wanted to share with you some information that you may find helpful when making a decision to allow your pet to have garlic. First, let us talk about if it is safe. YES, it is. There are a few things you’ll need to know though when it comes to how much garlic is ok. Some are fearful of garlic because it does have a compound found in onion (which we know onion is not good to feed your dog). Technically speaking a 60 lb. dog would have to eat more than 4oz of garlic in one sitting, which is several cloves, for it to be deemed unsafe. For it to cause any permanent harm to your dog this would have to be done several times over a course of a short period. Helps boost the immune system in your dog. Great food to for dogs fighting cancer or to help prevent cancer. Garlic increases the activity in what is known as “killer cells” by stimulating the functions in the bloodstream. Garlic detoxifies. Their liver will be happy with garlic. The compounds found in garlic can enhance liver function by getting rid of the toxins in the body that then are not absorbed by the liver. Prevent tick/fleas. Just like garlic fights off Dracula, it can fight off those pesky fleas and ticks. Blood clot prevention. Garlic has a compound that that can prevent the forming of clots in your dog's vascular system. It can also assist with lowering fat build up in arteries of the heart and reduce cholesterol. Fight off internal and external bacterias. Garlic is a wonderful natural source to fight off viral, fungal or parasites like tapeworms. Use it as a topical ointment when mixed with olive oil for ear mites. Note: Dogs with any anemic conditions or that are having a surgical procedure should not be fed garlic. Do not feed your dog garlic if they have an autoimmune disorder. We do not recommend garlic for puppies under 8 weeks. Puppies do not reproduce red blood cells until 8 weeks. Please consult your veterinarian should you have any concerns. Stop in and talk to us about the other wonderful benefits of adding garlic to your dog’s diet. We carry many products in or market including the kitchen and bakery. Healthy Dogma Flee Flea Flee! It’s a Saturday afternoon, you’re firing up the grill for friends and family when you look over to see your dog in the middle of the yard eating grass. Eating grass is something you see a cow or goat doing, but not your pooch. You think, “he just ate, he can’t be hungry. Or maybe he doesn’t feel well.” Believe it or not, Pica, which is the technical term for “eating things that are not categorized as food” is quite common and doesn’t always mean a serious problem with your dog. There is a speculation that dogs eat grass because they feel sick in their stomach and it is a way to make themselves vomit. There is no real science behind this and actually less than 10% of dogs that eat grass have any signs of being ill before they began to eat the grass. Some dogs are just B.O.R.E.D. Bored! However, the biggest reason dogs eat grass is due to nutritional necessity. If you see your dog going to town munching on grass it may be a sign they are not getting enough minerals, natural herbs and vegetables in their weekly diet. Grass isn't bad for your pooch but you may want to find some alternatives to add to their diet like Green Tripe, Zukes Super Green or even Kitty Grass, yep kitty grass which includes barley, oat, and rye, is good for dogs too. Stop by the market and ask about our pet greens and grass alternatives. Note: if you feel your pet is sick please contact your vet for assistance. The most famous physician of all time, Hippocrates, wrote: let your food be your medicine and your medicine be your food. First, let’s talk about the process of pasteurization and why taking raw milk and putting it through the pasteurization process actually impacts the benefits of milk. This process actually destroys enzymes, reduces the vitamin content of the milk and even destroys the beneficial bacteria. This process also contributes to allergies and tooth decay among a slew of other ailments. In 1929 John E. Crewe, M.D., the founder of the Mayo Clinic, wrote an article titles “Raw Milk Cures Many Diseases.” In this article, he speaks about the benefits of raw milk and how it can assist in many chronic diseases including asthma, kidney disease, obesity, poor digestion, heart disease, colitis just to name a few on his list. Let’s get to why feeding your pet raw goat's milk is beneficial to your pet! Probiotics - Raw goat's milk is filled with probiotics, natural probiotics! Probiotics prevent issues like colitis, IBS, and diarrhea. Natural probiotics are much faster to absorb for your pet vs. powders and pills. Relieves arthritis pain - Enzymes that help with digestion have been linked to helping to alleviate inflammation in joints. Itchy allergies - Probiotics = Yeast fighter! There is this awesome thing called caprylic acid which is found in raw goats milk. This acid fights off yeast and destroys it. Raw goat's milk can help with stopping your fur baby from itching. Malnutrition - If your pet is underweight or is showing signs of malnutrition raw goat's milk is the go to due to the easily absorbable protein it is filled with. Cancer - There is research being done now that the carotene found in raw goat's milk can help prevent cancer and that conjugated acid also found in raw milk is believed to shrink cancerous tumors. It’s delicious - Your dogs will love this! It’s a great treat for your pooch. If your pet is a picky eater topping their kibble with raw goat's milk will have them enjoying their meal. Raw milk of any kind is not a complete meal, but a perfect addition to any dry, raw or canned diet. Stop in and ask us about raw milk! We carry only the best, thank you Jaqueline and Roxanne of Answers Raw Goat's Milk. Can My Dog Eat Popcorn? Why yes, your dog can certainly have popcorn. But before you sit down and watch a movie and cuddle up to Fido there are a few things you need to keep in mind when feeding your dog this ancient popular snack. Take into consideration how the popcorn is prepared. It’s all in the preparation. You can certainly give your dog yummy popcorn but you must prepare it properly. Air popped popcorn is the best way to go. Stay away from adding salt or flavors. Avoid anything with flavors like caramel, fake powdered cheese or any other imitation seasonings. A natural unsalted popcorn has many nutritional benefits for your dog. As plain as popcorn is, and most people think it’s all air, it has a lot of nutritional value, containing a lot of essential minerals. Popcorn contains vitamin B, thiamine, riboflavin, and protein. It’s filled with complex carbohydrates, antioxidants and is very low in calories. Don’t forget the fiber! Popcorn is high in fiber. So start popping! Consider adding popcorn to your normal dog treats when rewarding. Your dog will love the crunch of it and enjoy the taste. You can have some too, share the love! Note: Your dog should not have more than 10 mg of sodium per pound of body weight a day. So this would eliminate any microwave popcorn. Check the back of the box before thinking the unsalted stuff has no salt in it! Stop in here at the Dining Dog and Friends and pick up your kernels for your at home use or a bag of popped popcorn made right here. It’s organic! Eggshells and natural eggshell membrane is loaded with calcium carbonate amongst many other beneficial things for your pet and you. So why does that matter to your dog? Let us first decipher the difference between raw eggs vs. hardboiled eggs. It’s pretty simple. Primarily composed of fibrous proteins such as collagen type I.
Glycosaminoglycans, such as dermatan sulfate and chondroitin sulfate and sulfated glycoproteins including hexosamines, such as glucosamine. Hyaluronic acid, sialic acid, desmosine and isodesmosine, ovotransferrin, lysyl oxidase, lysozyme, and β-N-acetylglucosaminidase. Yes, egg yolks do carry cholesterol and saturated fat. However, many nutrients are contained in that yolk, such as your fat-soluble vitamins, essential fatty acids among other nutrients. More actual nutrients verses the egg whites. Please refer to the chart below for further details! Here at the Dining Dog and Friends we believe the egg and eggshells are the perfect food. All of the above is contributory to your dogs overall strength, endurance and performance throughout its longevity. Especially for joints, connective tissues, bone strength, healing and more! Now…Let’s prepare your pups perfect egg! The important thing you must remember is the utilization of clean water. Meaning reverse osmosis, distilled or spring water when boiling your eggs. Please do not use municipal sourced water as it may contain chlorine and fluoride among other things. We must remember…an egg is porous which means penetrable. It can absorb unwanted chemicals and pollutants from your water SOURCE thus being transferred to your pet. Please allow the egg to cool and let your babies go for an Easter Egg hunt. TO YOUR PETS HEALTH! I Got Worms! We Have A Natural Solution! Your pet may be telling you or presenting signs of parasites such as, bloated belly, lack of appetite, vomiting and sporadic diarrhea. Diatomaceous Earth is a safe natural option for you to combat an infestation of parasites in your dog or cat. DE is fossilized remains of microscopic shells created by aquatic plants called diatoms. In plain terms, the mechanics behind this is pretty simple. Diatomaceous Earth sharp edges (that are microscopic) make contact with the parasite and is able to get thru their protective outer shell that will eventually dehydrate the parasite which will cause death. Eggs of the parasite or insect is effected the same way. Note: the type of Diatomaceous Earth you want to purchase must ALWAYS be food grade. For those internal parasites you can treat your pet by spreading the powder over their food. This should be done for a week to 10 days and will eliminate most parasites if fed daily. However, to kill the eggs you must feed for an additional 30-60 days to destroy any new hatched parasites. This should rid the body completely. DE is neutral tasting. Mix with wet food or water once a day or add it to The Dining Dog's Yogurt or Whey. You can also treat your pets from those external bugs including fleas, ticks and more. You can easily do this by dusting your dog with Diatomaceous Earth. Also, you can rid your home of fleas by using DE around your home. Don't forget to include their bedding and carpeted areas they frequent. Note: DE kills Bed Bugs. Diatomaceous Earth is very cost effective (we hate saying cheap, but it is) to rid your pets from those nasty irritant parasites. Stop in and get your Diatomaceous Earth as this should be a staple in every animal loving home.